But the songwriters behind the film's music, Kristen Anderson-Lopez and Robert Lopez, were enlisted to write additional material for the musical - a daunting prospect given the classic status of the originals. "We felt the pressure, but that was the something we had to, well, let go of," says Robert Lopez in what sounds like a genuinely unintended pun. "Because there's no way to really create from pressure, you have to create from a sense of play and enjoyment and love." Kristen Anderson-Lopez adds that the new songs were not written for the sole purpose of lengthening the story, "because then they would just feel like padding". 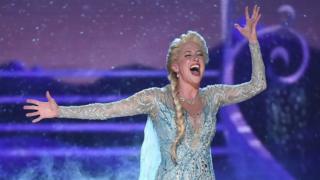 Frozen had strong ticket sales during its first year on Broadway and is currently booking until August. A North American tour also begins later this year which will continue until at least January 2021. "A likable transfer for the animated phenomenon will please fans but an extended running time highlights a thin plot," she wrote. "Frozen could be more inventive, more imaginative, more vital, more necessary. But as those little girls would almost certainly say, let it go." Jesse Green in the New York Times praised some elements of the show but also said there were a few "icy patches". "You can feel the director, Michael Grandage, and his design team straining to make something artistically worthy of the property's commercial promise," he wrote. But Grandage, who is also directing the London production, says the West End version won't be exactly the same as one currently playing on Broadway. "We don't want to just replicate a production," he tells BBC News. "We want it to evolve and respond to the time of watching it. "And so London will offer us an opportunity to make some adjustments, enhance and develop everything. "We want to give a bespoke production in England. On one level it could be technical, the magic we use in the show, the spectacle... we want to make sure we evolve with the technology that's available to us." "I'd never directed a new musical before, I'd just directed a lot of music revivals," he explains. "And so I've always been seeking the opportunity to do a new musical, because you can collaborate with the book writer, the lyricists, the composers, and work on something you can develop with them for the first time." Jennifer Lee, who wrote the script both for the film and the stage, says one of the main benefits of putting the story into the theatre was "being able to open these characters up". "Elsa became much richer," she explains. "She had so many more dimensions to her, and on stage we're able to get to know her a lot better than we do in the film. "The film was the blueprint, but what we were actually allowed to do was go as deep into the story as we always wanted to do. "And sitting in the theatre and writing and seeing the actors in front of you, they're alive and you're able to work scenes and lines, which is pretty opposite of the experience in film, especially in animation, where there's a lot of projecting of what will become, and only getting pieces of the process along the way. "Theatre is much more immediate, and it gives you a lot of room to work your craft." "We're on 12-hour days, seven days a week right now!" she says. "We've been so focused on Frozen 2, we lock in June. [After that] I'll be able to open up my focus." "Years of retail have created the idea that Frozen is this thing for little girls, but it's a very rich and adult story about trauma from childhood and the way it can freeze people into roles for their lifetime," she says. "When the film first came out, adults said, 'Oh I love Frozen'. But somehow, because of the lunchboxes, two years later, everyone came up and said, 'Oh my niece loves Frozen'. "And we were very anxious to create a story where an adult of any age could say, 'I love Frozen'."